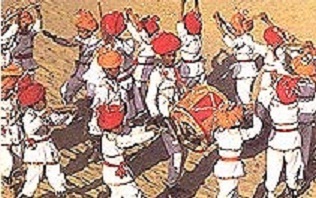 Drum Dance, Rajasthan: It is a professional dance-form of Jalore region of Rajasthan, where only the men participants can perform. In this dance, five men beat huge drums that are tied around their necks; a dancer, which holds huge cymbals in their hands, also accompanies them. For an additional effect, some member holds naked sword in his mouth.